I just got an email from a newsletter/blogger who states that CyGenX claims to have this stuff - astressin - B - inside the formula. Is that possible??? That would be hard to believe. Getting it made by another company is one thing. But to put it in a commercial product? I don’t think they could get away with that legally. » get away with that legally. AJ, here are some of the emails I have regarding GenX containing astressin - b. The first email is an email I sent them and the next two emails are from the company - GenX. I got an email from a newsletter called “Stem Cell Baldness Cures” and I do talk to the publisher quite a bit. I am a registered user of the newsletter and I’m happy to associate with them. I would like to tell you that the email I got from them recently states that you have told him that the drug called astressin – B is inside your growth factor mix. Could you please confirm or deny this. Just to let you know I have done a search and this agent – astressin – B is not avail to patients yet. It is only avail for research purposes as far as I can tell. Astressin – B is the stuff that was used in the recent mice studies that grows hair on 100% of mice that were made genetically bald. It’s a news story that’s been in the news lately. Are you saying that your formula has this stuff, Astressin – B, inside of your formula??? Give me a little time to produce something that is able to be documented. My comment was not clearly communicated to Julian, for which I take full responsibility. We are searching for a good marker for astressin - B in the examination of HFCM. We know that astressin - B is a protein (like other cytokines and growth factors from progenitor cells that are found in the Hair Complex) that result from stress, perhaps emotional (I do not know, perhaps) but certainly from hypoxia, heat, and multiple forms of wounding. They are up-regulated during conditions of stress. If you review the study at the University of Pennsylvania and UCLA both findings reveal conditions of imposed stress. In our video “How to Apply” on the web site http://www.YouCanGrowHair the use of a derma roller is demonstrated that may initiate one of the components useful in stress related hair growth. My point was not to authenticate astressin B but rather to focus on a multiplicity of proteins that are naturally secreted from fibroblasts that have repetitively yielded hair growth. Whether astressin B is found by markers or not, the underlying needs appear to be stress with growth factors to produce activation of the stem cells to produce hair follicles and hair shafts. Astressin B may be one more protein to do likewise. I will advise you in regards to our findings. Unknown. A marker is needed to determine it for sure. Not much known in the literature re: astressin B. Perhaps Histogen or some other company will develop a super-fast hair-growing elixir based on this technology. Some people on our list say growth factors will only work with “wounding” (a claim Dr. Leatherman denies). But as this recent mouse story shows, this does seem to be where the action is with hair-regrowth research. Well, I don’t claim to be a lawyer. It just sounds like it would be illegal to put into a commercial product at this early stage. But maybe it’s not. From the emails exchanges I would say that it looks like they may not exactly be asserting that claim - that astressin - b is inside their formula. I think it looks like they may have stated that prematurely and now they are backing away from that claim. I do not think they have any idea if astressin - b is inside this formula or not. I think they are backing off of the claim that astressin - b is inside the formula and I think that does make them look a little incredulous because they made a claim and now they are having to back off from that claim. 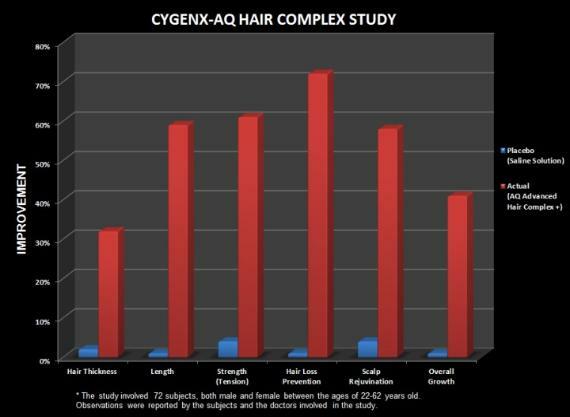 I read with great interest all of the “POSTS” on the Hairsite.com forum regarding the CyGenX AQ Hair Complex. Some of the comments do not merit a response while others were written very thoughtfully and although skeptical in presentation, the questions asked do merit a serious response. I appreciated those who defended the CyGenX product on the forum. Thank you. Before and After photos: I would like to make a comment and then afterwards invite those who wish to go to http://www.YouCanGrowHair.com and check out testimonials and Before and After photos on the page, How it Works. This product is new so data is limited. I am no different than all of those who want to “see” the changes with before and after photos, because we are programmed to do so. We all want to see with our own eyes! Before and after pictures are extremely powerful in weight loss surgery because the results are so demonstrable, the same with hair transplant surgery or breast augmentation, etc. With hair regrowth we are necessarily viewing a “work in progress”. Many want results “yesterday”. I certainly would select that as my first choice. However, biology is biology and repair takes time. Having treated over 20,000 patients in my professional career I had to remind my patients time and time again, that healing takes time. Innately, we all know this to be true, but it is often times difficult to collect the patience needed to “wait”. CyGenX is in the process of building a new video that will show what happens when the Hair Complex starts to work. The video will feature one of the most difficult case studies (ME) purposefully selected so that those who view it can conclude, “If the CyGenX AQ Advanced Hair Complex can benefit this guy, it surely will do wonders for me and my condition.” It will demonstrate without question the growth of new hair on a previous category 7 Norwood scale candidate, 62 years of age, that has not responded to any other type of hair growth therapy. It will show the hair growth cycle over a 7 month period of time beginning with a “cue ball bald” scalp condition (computer generated since I did not take a photo the day I started) and developing into vellus hair demonstrating that the follicles are not all dead. The progression in hair growth will include the transition from hair fuzz to more dense stubby hair fuzz and then transitioning to the development of a beginning hair shaft and finally into a mature terminal hair. This, I think, will help convince the skeptical readers. Be aware, I appreciate the skeptics. I was one of them. We have tried all of the promised products only to be disappointed time and time again. We have legitimately earned our skepticism. The problem with before and after photos is this: you cannot easily or readily see the vellus hair and the small stubby growth of the hair fuzz eventually transitioning into terminal hair. There are what 100,000 to 150,000 hairs on the human head. How can we really detect hair growth from photos in just 90 days. Now, I have selected photos and placed them on the web site but it will take a very careful eye to note the changes, but it is doable. Most photos tract the scientific study subjects for only 90 days. The real results will show up following the subject after approximately 2 years. Here’s the “rub” of reality: The longer the condition goes untreated the longer it takes biology to repair it. We all know this to be true. So it is an individual question that each one must answer: when is the evidence sufficient? All of present day science is pointing to growth factors as the answer, and I do not mean just in hair growth. In my co-authored book with Dr. Ahmed Al-Qahtani, M.D., Ph.D., citing the CIRM Report, Alzheimer’s in mice was reversed using BNGF: a growth factor. (To receive your own copy FREE of CHARGE go to http://www.YouCanGrowHair.com and input your name and email address and you can automatically download the book onto your computer.) Many other studies in many other venues like diabetes, heart disease, post stroke victims and too many more to mention in this “POST” validate the same. These growth factors and cytokines “turn on” inactive parenchymal cells no matter where they are located in the body. No one who respects science and scientific studies can refute these statements. The University of Pennsylvania research published in early January of this year and the UCLA study released this month both point to enzymatic proteins needed to “wake up” the dormant stem cells that are present in abundance in the human scalp. A future study of great interest: I will cover this in more detail in my next POST. But it involves the combined use of the Hair Complex with surgical hair transplant and the potential of greater survival and growth rates. change xxxx to “hairloss fight” without the space. It is the same thing, because they use the same pictures on both sites. This may not be legitimate. But even if they are sincere, one thing is for sure, there is no evidence that it does anything at all. Read the thread and come to your own conclusions. How come you had such amazing results in your supposed studies and you drew this amazing graph of results?dont you have any pics from the studies that might support these wonderful graphs? I see you avoided to show us new hair growth in these supposed studies?WHAT IS the last graph that displays this vague “overall growth”? Does it mean new hair growth or what? Are you for real? how are you allowed to post in here is beyond me!!! » might support these wonderful graphs? » new hair growth or what? » Are you for real? how are you allowed to post in here is beyond me!!! This is ridicolous, while there was no cure in sight everyone was cautious and right now with a cure really coming close you guys are falling for hocus pocus. Why don’t you ask Histogen? They’ve observed, quantitated and photographically documented hair growth that their product generated at the 3 month mark. And do you expect to have your studies taken seriously when you didn’t even take a baseline photograph? You’re using “computer generated images” for baseline??? I tried this product in2009. At that time doctor Al Qatani or dr AQ was talking and now Dr L is talking. Almost everyone in that forum tried it with no result. At it was same story someone like googoo was bringing this up while doctor AQ was convincing everyone how good his product is. About 2 months ago I received an email from them regarding the miracle and improved version and if I wanted to order as one of the previous customers. Please hairsite ban this doctor along with googoo.